The War Mouse vinyl figure by Clogtwo and Mighty Jaxx returns for its last and final strike! Known to be deceptive and destructive, the War Mouse works silently in a systematic order to create tension and chaos within their enemy lines. With two black smoke bombs and raised fists, the War Mouse is about to take our world by force in a fantastic “Riot Blue” colorway. 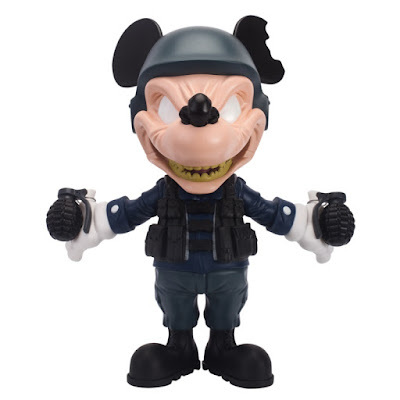 Inspired by Disney’s Mickey Mouse, this blue War Mouse stands 10.24” tall and comes packaged in full color box. Limited to just 150 pieces, the Riot Blue Edition War Mouse art collectible is made of PVC and can be purchased now at the Mighty Jaxx online store for $100.